Leader of the free world, Donald Trump, is fresh off his successful NATO renegotiations tour, with defence spending concerning predominately EU countries being a success in already achieving a $33 billion increase in spending from all nations involved this year. Donald Trump highlighted Germany publicly at NATO meetings at their lack of defense spending and that they’re basically owned and dependent on Russia, in terms of the Russian oil and gas. 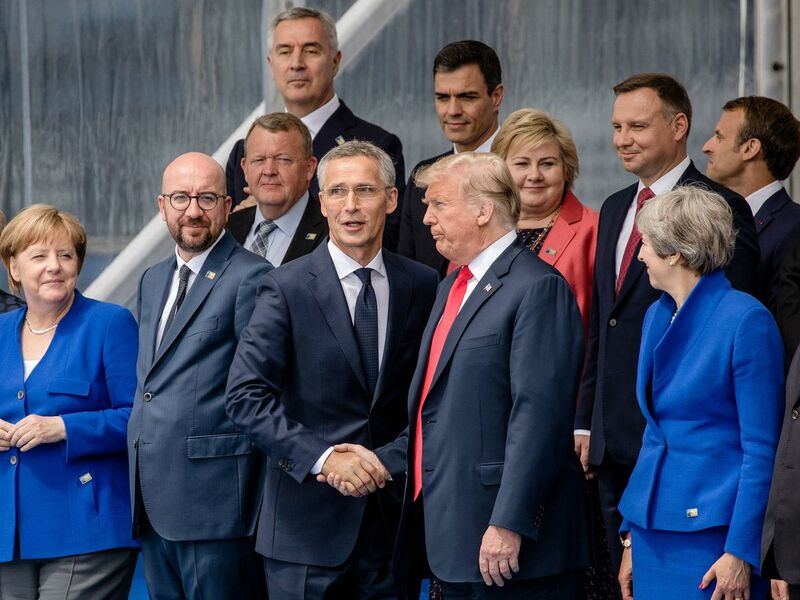 After these successful negotiations meeting at NATO, President Trump also reaffirmed U.S. support for NATO today, with a nice message stating “I believe in NATO”, and said the United States is committed to their Western allies. Donald Trump is demanding NATO members to up their defence spending by double the 2% negotiated in 2014 through to 2024, seeking a 4% gross of GDP from member nations to pay their fair share in future. However, many nations had not met the earlier 2% agreed defence spending over the years either, hence why Donald Trump has been disappointed at the spending figures. Trump said about the 2%, “Ultimately, that will be going up quite a bit higher than that” suggesting the earlier mentioned 4% gross GDP that he revealed on Wednesday, to be what he is ultimately seeking. Donald Trump also spoke this morning in a closed session about the tensions in Georgia and Ukraine, as well as the importance of relations with Russia. 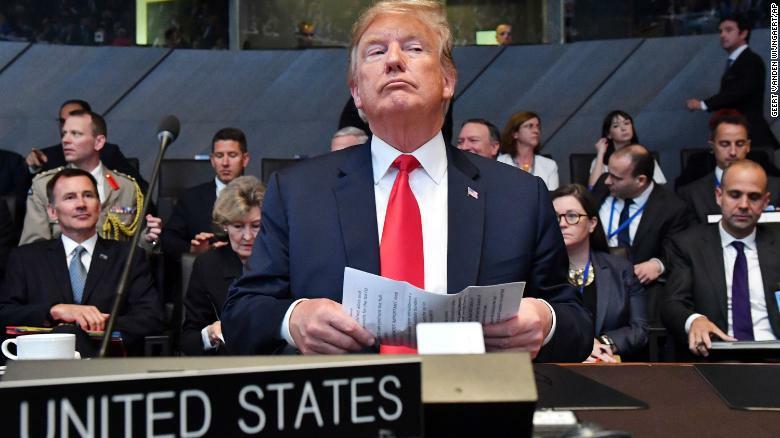 He also pointed the finger at Germany and Spain for their lack of defensive spending over the years, and for relying too heavily on the United States of America for security and protection. Donald Trump was armed with facts and figures, sending some diplomats into what was earlier described as a “tailspin”. Overall, it was described as “a well planned summit” from the U.S. President. Trump said in the closed door meeting in Brussels, that if NATO nations didn’t spend the minimum 2% GDP by January 2019, the USA would go it alone, according to two officials present in the meeting. Many felt that this means that Donald Trump could and would pull out from NATO, unless expectations were met in future. Germany agreed to accelerate its defense spending. President Trump presented that the $33 billion increases this year are evidence that his push was having a positive effect. Trump emphasised, “They are spending at a much faster clip; they are going up to the 2 percent level”. He stipulated that spending would increase in a very short number of years. Both Angela Merkel and Emmanuel Macron are seemingly willing to comply with new defensive spending commitments, which should be seen as a successful outcome after the NATO summit. So, what’s on the agenda for Trump’s UK visit? Tonight, Donald Trump and First Lady Melania are reportedly invited to a wonderful dinner at the birthplace of Winston Churchill at Blenheim Palace, and is also expected to meet and hold very important and beneficial talks with Prime Minister Theresa May. There may be a very private meeting with The Queen on the agenda, (which is a wonderful thing), among other unrevealed plans which will bring the allied forces of the UK and the USA back stronger and even closer together than ever before. That’s the plan. Also worth a mention are the left wingers and socialist protestors, whom are clearly brainwashed and deranged by the establishment mainstream news media and through liberal indoctrination, and these groups of people have already been described by MP Ian Paisley Jr. on BBC News, a little earlier, as “idiots”. Furthermore, they are welcome to make “idiots” of themselves in tomorrow’s protests, which is a view shared by many people. Some of the “idiocy” will be the Trump baby blimp effigy that will be flying in the sky tomorrow, which will be yet another embarrassingly laughable symbol of leftist “idiocracy”, which will solidify their moronic views even more so now, after Trump rallied together all the nations successfully at NATO. We extend our welcome to President Donald Trump to the United Kingdom, and we hope that it will be a wonderful success for the USA and UK in also making plans for important trade talks, post Brexit.